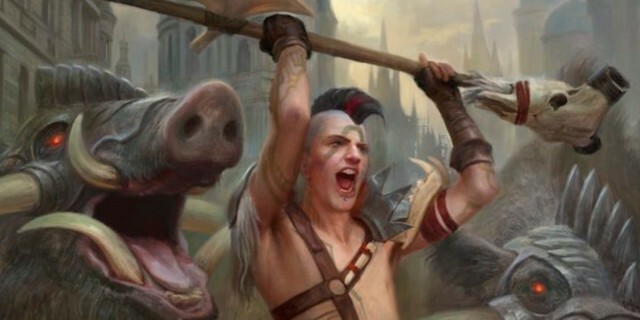 Article > Hareruya Pros Blog > Ravnica Allegiance Brings a lot of New Toys to Standard Players! Hi everyone! Spoiler time is over. The new set is around the corner, and I’ll tell you something. Things will change! 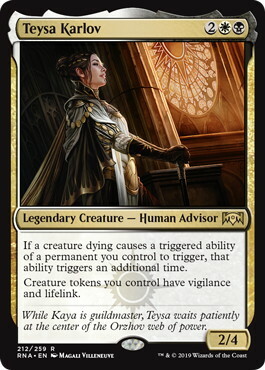 Ravnica Allegiance (RNA) has so many good cards with the potential to affect Standard and make the format different. 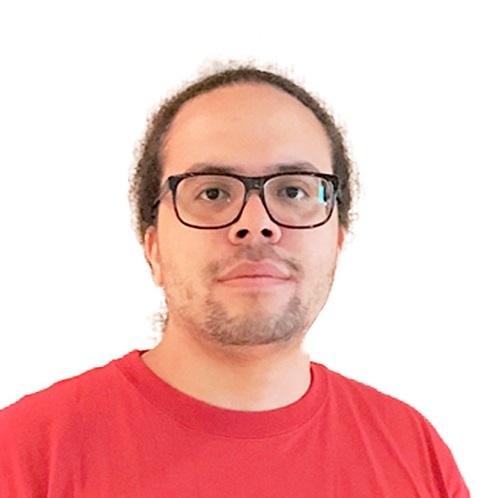 What’s more important – everyone can find a piece of cake for himself, doesn’t matter if you’re an Aggro player or you love long Control mirrors. 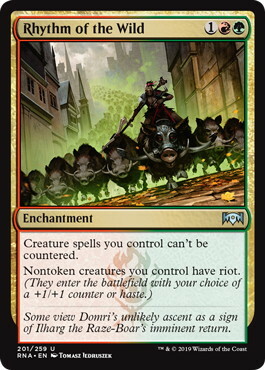 New Ravnica will bring something new and powerful for everyone, and in this article I’ll try to prove you that I’m right. Please keep in mind, that I didn’t have a chance to play with the new cards yet, so it’s just my first opinion based on my experience, and in some parts it might be simply wrong. Also, decklists provided below are just an easy example of how you can us new cards, and synergy between them. As I never tested them, I’m pretty sure they are far from being good, and well tuned. Use them as an inspiration, not as an example of “ready to play 75”. In my next article, after the set releases and I get a chance to play with new cards, I’ll do my best to provide you more tuned lists! Here stuff is easy to figure out. 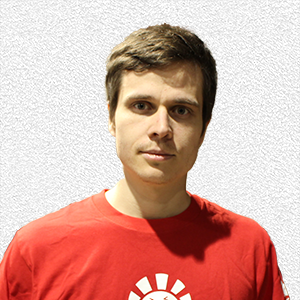 We have two Guilds, that provide us new keywords. 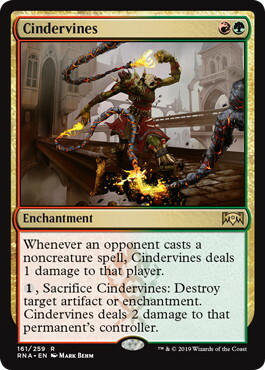 Both Rakdos (Black-Red) and Gruul (Red-Green) mechanics are super aggressive, but require a different way of deckbuilding. 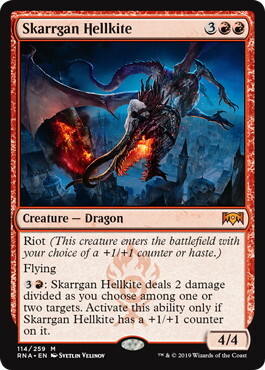 Let’s start with Rakdos Aggro. 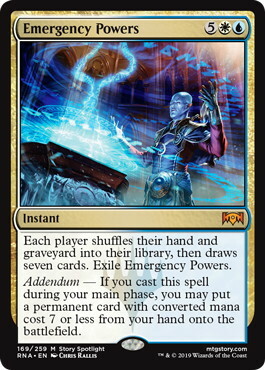 – You may cast this spell for its spectacle cost rather than its mana cost if an opponent lost life this turn. 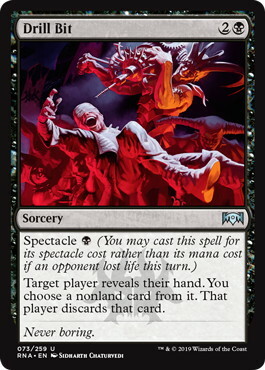 Spectacle is a very specific mechanic. In order to abuse its full power, we have to focus on making our mana curve low and on applying pressure from the first turn. 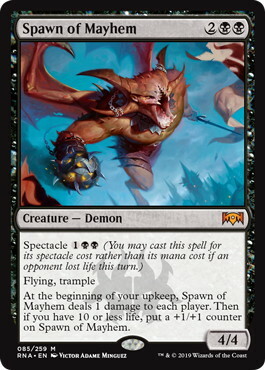 《Spawn of Mayhem》 is an all-star, and building a deck around him seems to be worth it. The best way to do that is to play many one and two drops. 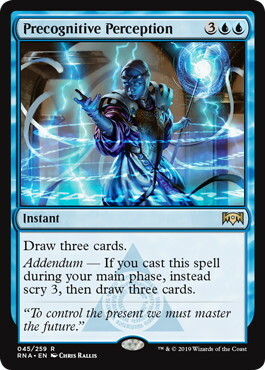 Ideally I would love to see something like 《Thermo-Alchemist》 that can consistently turn on Spectacle on our turn without going to combat. Unfortunately 《Spear Spewer》 doesn’t look like a Standard playable card, but who knows? 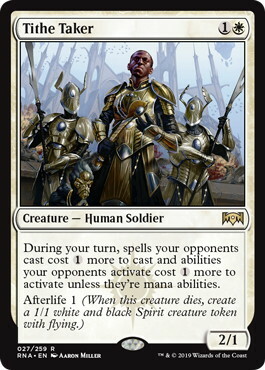 Historically black-based Aggro were good, when we had cheap creatures able to come back from the graveyard in the midgame, so there was a way to go all-in in early turns, and recover later, if something went wrong. 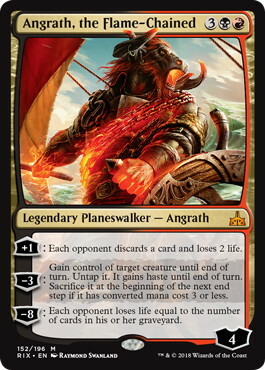 Do you remember 《Bloodghast》, 《Dread Wanderer》 or 《Relentless Dead》? 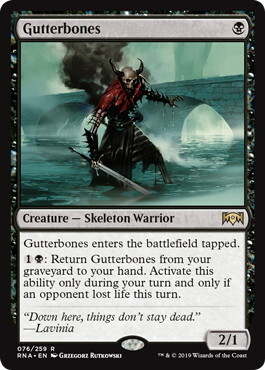 Now we have 《Gutterbones》 and 《Graveyard Marshal》 alongside with overpowered Demon (come on, 4/4 flying, Trample with upside for 3 mana? 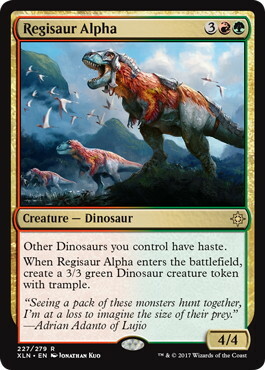 I don’t think there is any stronger card in the set in terms of raw power), and a fairly easy way to splash a cheap red removal. – This creature enters the battlefield with your choice of a +1/+1 counter or haste. Usually just Haste, but it’s good to have an alternative, especially if you face a big blocker on the opposing side. Did you ever dream about playing 《Carnage Tyrant》 with Haste on turn 4? Now, it’s not only possible, but also realistic! 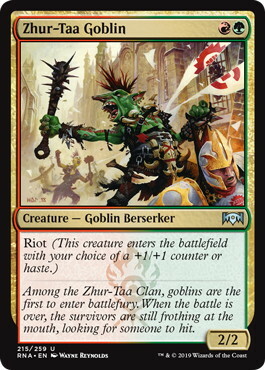 All thanks to Gruul’s leader! 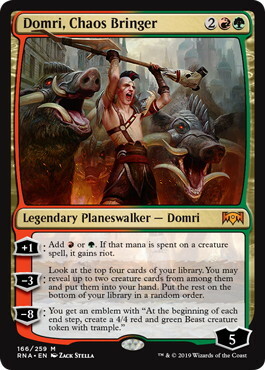 With 30 creatures 《Domri, Chaos Bringer》 is an acceleration, that gives you tempo advantage due to Riot, source of card advantage, and a win-condition itself, with his powerful Ultimate. 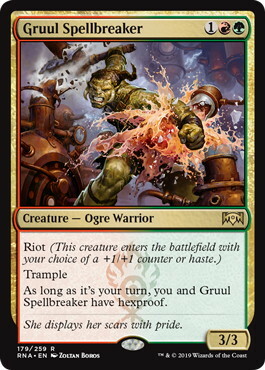 《Gruul Spellbreaker》 is your insurance against 《Settle the Wreckage》. 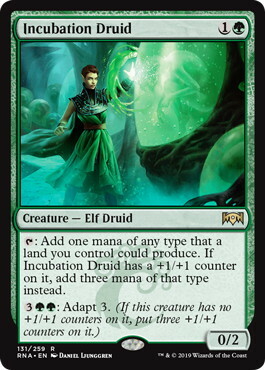 《Incubation Druid》 is a nice addition from Simic Guilde. 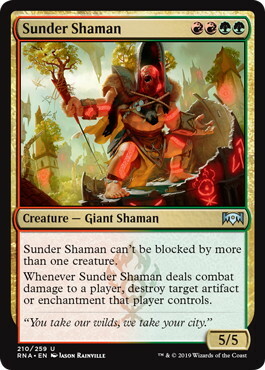 Mana dork in early game, that transforms in a real threat later, providing a way to spend your mana, when you don’t have a better use for it. 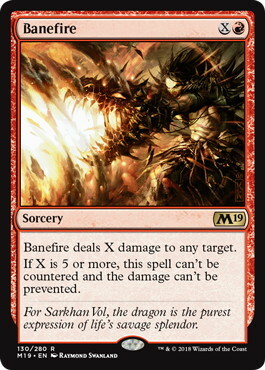 Works well with 《Banefire》 and 《Fight with Fire》. 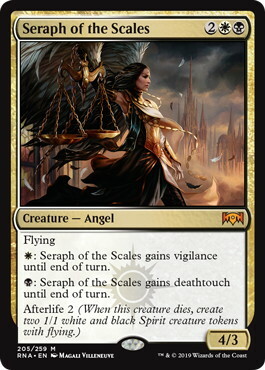 Do you remember 《Archangel Avacyn》? 5 mana angels with Flash are usually good. 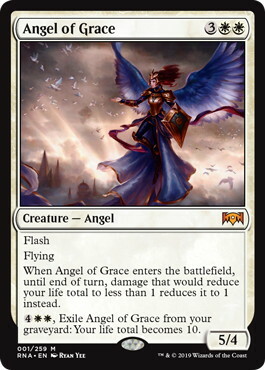 《Angel of Grace》 might not be on the same level, but can help you with racing your opponent in a pretty effective manner. Another card that looks awesome if you use its full power is 《Priest of Forgotten Gods》. 《Priest》 works great with Orzhov’s ability, so I tried to combine things together and unlock the synergy. Deck is made from scratch and it surely can be improved. 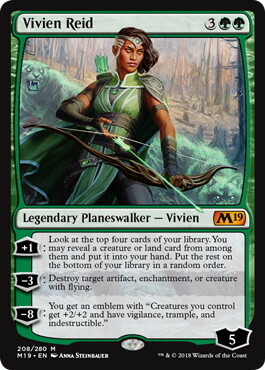 I just can’t wait for MTG Arena and Magic Online to release RNA, so I can try all the cards together and find out how to build it properly. – When this creature dies, create N 1/1 white and black Spirit creature token(s) with flying. With list above your main goal is to create as much two for one value as possible. 《Priest of Forgotten Gods》 has a great synergy with the whole deck, and slows down your opponent while ramping you at the same time. 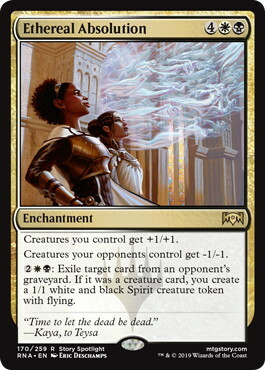 Orzhov Midrange has more good cards available than we need, so there will be a space to build it in a way to get an edge versus expected metagame, in a similar way that we have now with Golgari (Black-Green), where we have several builds of Golgari, each good versus different decks. 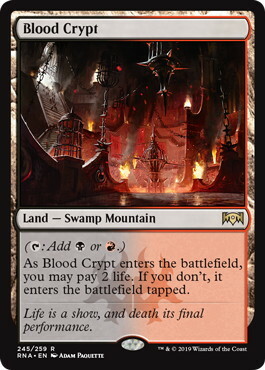 With access to 10 Shocklands and 10 Checklands now we can experiment a lot with mana bases. 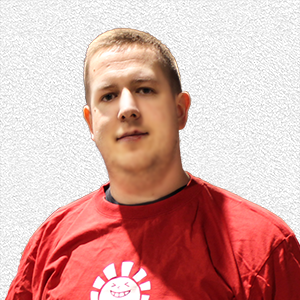 Do you remember the Big Red Deck that we, as team Poland, played on the World Magic Cup 2018? Deck was OK-ish. It had some good and some bad match ups. 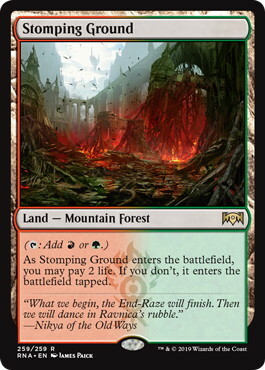 One big problem of this version of red was a Control match up, where there was not enough pressure to be able to finish the game with 《Banefire》, another one was resolved enchantments, such as 《Experimental Frenzy》, that red didn’t have a single answer for. 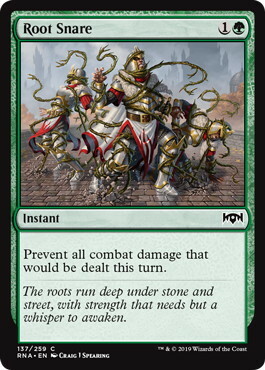 Now with access to green and black splash basically for free, we can play good sideboard cards to solve this issue. What’s better, the greatest friend of 《Goblin Chainwhirler》 is waiting for us! 《Status // Statue》! Mana base depends on sideboard cards that we want to play. I’m pretty sure 《Duress》 is good here, so we might need more black sources. 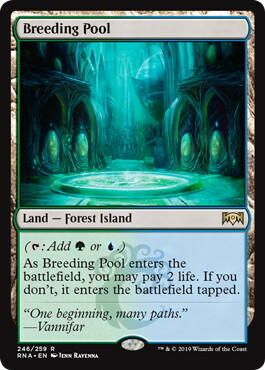 In almost-mono-colored-deck Checklands should be better than Shocklands, as they come untap for free, but it’s good to have a right mix, as they work the best together. 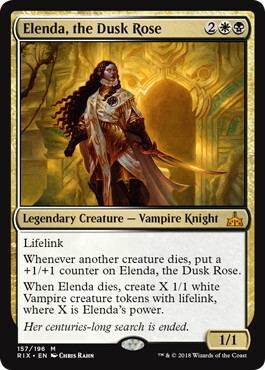 We got a lot of cool stuffs in RNA that suit great in Control decks. 《Absorb》 seems to be the biggest player here. 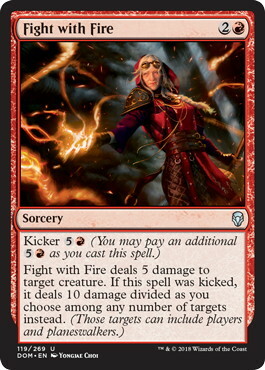 Since 《Banefire》 is a well-known Control’s enemy, being able to gain some life for free might be a game breaker. 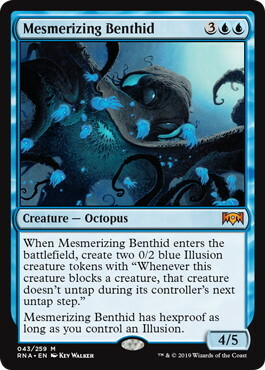 Thanks to the new counterspell we finally don’t have to play terrible magic card – 《Revitalize》. 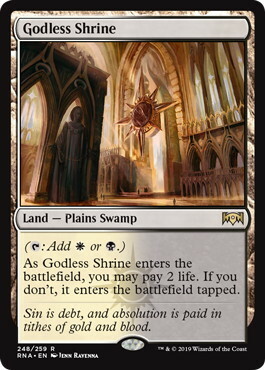 Other than that we got 《Kaya's Wrath》 and 《Mortify》 if we decide to play Esper (White-Blue-Black), which now is possible thanks to reprint of 《Godless Shrine》 and 《Hallowed Fountain》. 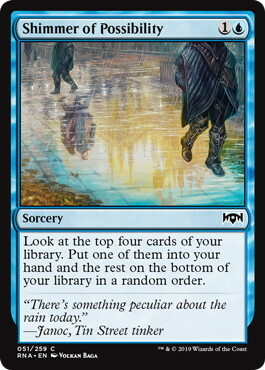 《Precognitive Perception》 is another good card draw spell, I’m not sure if it can beat 《Chemister's Insight》 though. We also have some less powerful cards, that we should keep our eyes on, and at least try them – 《Mesmerizing Benthid》, 《Sphinx of Foresight》. 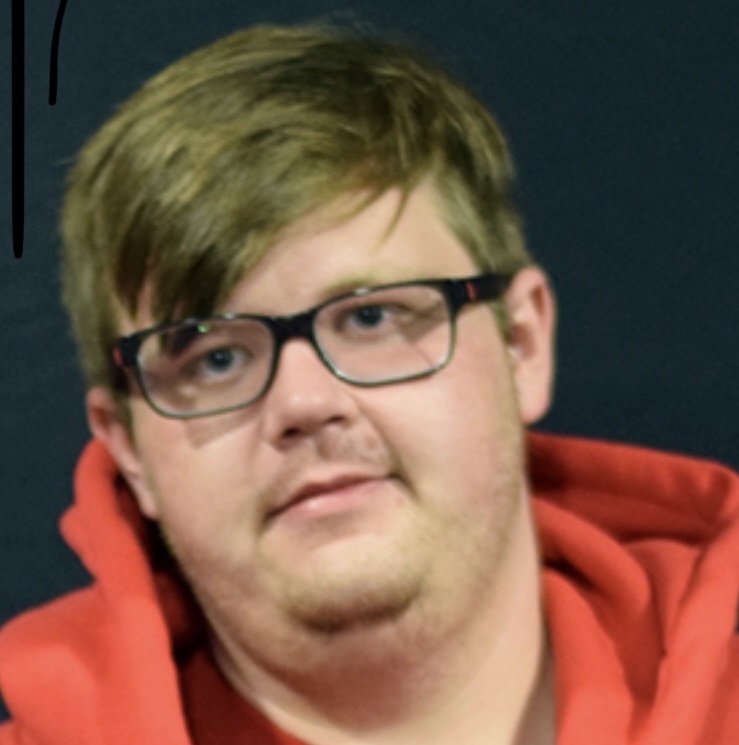 Gregory Orange wrote a nice article about Control decks in the new Standard, so in order to don’t make my article too big, and to avoid copying his thoughts, I’ll just recommend you to give it a read! Just. One. Thing. 《Wilderness Reclamation》. The one picture is worth more than a thousand words. 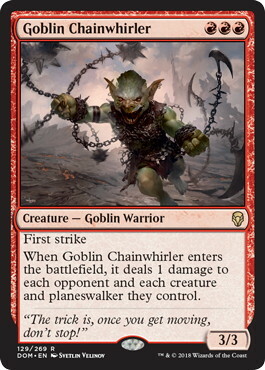 I honestly believe that might be the most impactful card of early Standard. Just an uncommon that doesn’t even belong to any Guild. In the right deck it provides insane value. 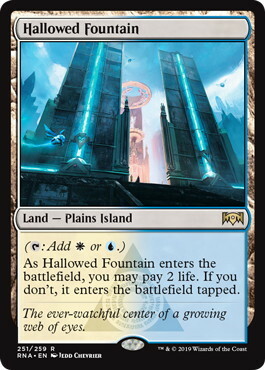 Not only, you can cast it for free (untaps your lands in the turn you play it), but also ramps you by insane number of mana every following turn. There are few checkboxes that we have to tick. 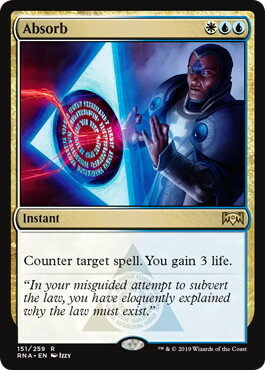 First of all, we need many instants to gain full advantage of untap trigger happening during end of our turn. 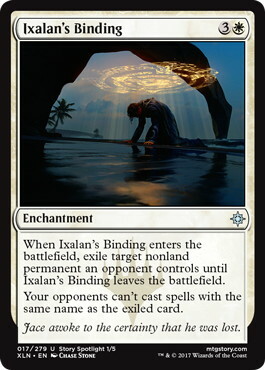 Other than that we need cards in hand, in order to use free mana consistently, so some card draw spells are welcome. If we have all above, that means we’re doing nice and fancy stuff, but we’re unarmed against aggression. Let’s add something that helps us survive and do more fancy stuff! Now you probably know where it’s going. Yes. Some limited unplayables and a random buy a box promo. 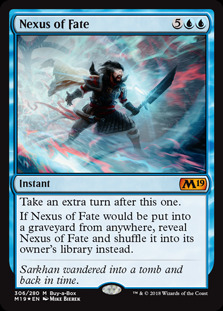 《Root Snare》 and 《Nexus of Fate》. 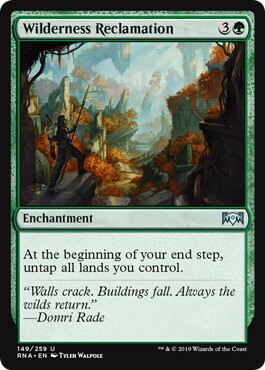 With 《Wilderness Reclamation》, 《Settle the Wreckage》 gets better, because you always can untap with four mana, that’s why I prefer it over the three mana 《Fog》 spells like 《Pause for Reflection》. 《Precognitive Perception》 is an extremely strong magic card if you can cast it during your turn, and this build gives you the best opportunity for it! 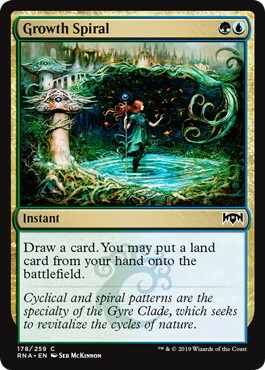 Last but not least, RNA brings us five new Shocklands, that unlock a lot of potential for three or even four color decks. 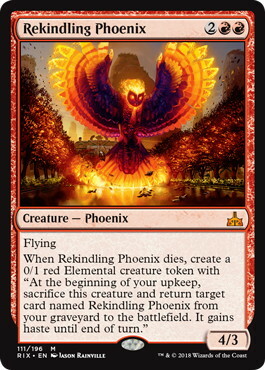 There are good cards in some color combinations, that were not played because of the mana base restrictions. Now you can play everything you want, and your mana base will be reasonably good so be open-minded at don’t hesitate to try new things! Now, when the format is unexplored it’s the best time to experiment with different stuff and find something that you like!